My writing features characters struggling with an issue they need to surrender, and in Entangled, Carla Rowling can’t let go of the past. She keeps carrying the shame she felt back in high school when she became pregnant, and her first love, Wayne Peterson, abandoned her. Her son is now a teenager and Wayne’s back in town asking for another chance. She’s afraid Noah will repeat her and Wayne’s mistakes and that Wayne’s charming ways will distract her from her loyal and caring boyfriend, Will Marshall. If that’s not enough for Carla to deal with, she’s been given the funds to leave her job and start cosmetology school. The gift is so generous she doesn’t feel worthy. The more she focuses on what she did wrong, the more she creates chaos for everyone around her. I’ve met a lot of Carlas, and my heart breaks for them. They have God’s forgiveness, but they refuse to forgive themselves. They are in such a cycle of self-sabotage they can’t even see the blessings around them. Carla has a great relationship with Noah, and Will Marshall treats them both well. Carla has a great opportunity pursuing her dream of becoming a stylist, but she’s scared of failing. Her fears drive her to isolate herself from Will, push Noah so hard he rebels, and compete so hard with the other cosmetology students that she risks alienating them. Most women need a rock bottom experience before they surrender the shame and realize God’s love and forgiveness was for them all along. I won’t give the story away, but Carla definitely has to confront her past and her choices. That’s why I love the first part of Song of Solomon 1:5. Although many commentaries talk about how “I am dark, but beautiful” is a literal statement about her skin color, I had a friend challenge me to consider if she meant her past. The young woman in that verse had been abused. Her story wasn’t a happy one. Yet she was challenging the others to see her inside, because everything about her was beautiful. Just like us, if we’d only allow ourselves to receive that truth. Entangled was very difficult to write and I thought about quitting many times. Now I understand why. As readers contact me privately and share how God showed them while reading that they had an issue from their past that needed surrendering, they started healing. That’s why I write. I long to see women live free, and I believe contemporary romances are the perfect vehicle to let that unfold. How about you? Is there something from your past that you are holding onto that is robbing you from a wonderful now? 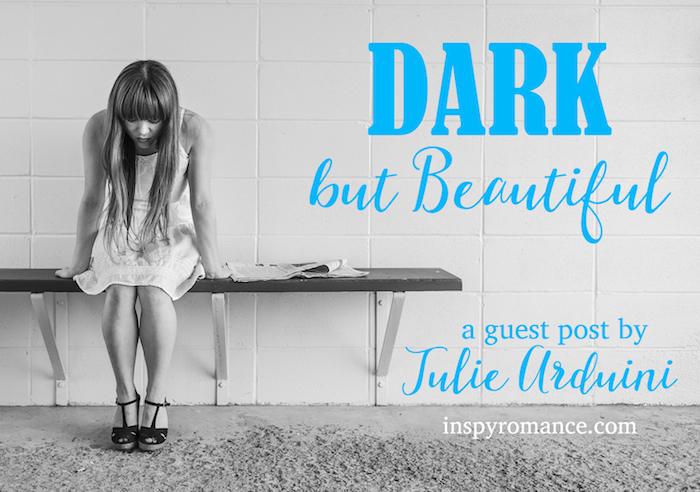 Do you see yourself as “dark,” or lovely? Because you are beautiful, no matter what your past says. 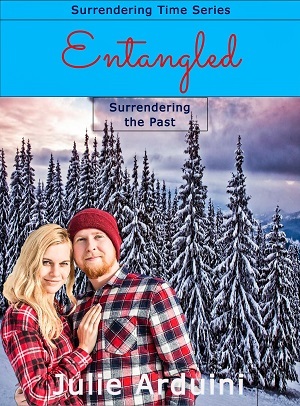 Entangled is book #2. Although it can standalone, click if you’d like to read Entrusted: Surrendering the Present first. Julie Arduini loves to encourage readers to surrender the good, the bad, and — maybe one day — the chocolate. She’s the author of ENTRUSTED: Surrendering the Present, as well as ENTANGLED: Surrendering the Past. She also shares her story in the infertility devotional, A WALK IN THE VALLEY. She blogs every other Wednesday for Christians Read. She resides in Ohio with her husband and two children. Learn more by visiting her at http://juliearduini.com, where she invites readers to subscribe to her monthly newsletter full of resources and giveaway opportunities. Hi Valerie and Julie, thanks for the book introduction. I have not read any of your books Julie, but will go and check them out. Great insights into the first part of Song of Solomon, I found that really intriguing. Thanks for a thought provoking post. Thank you for reading this! I love writing about surrender issues and characters who love chocolate, like I do. :) Have a blessed day! Thank you for introducing us to Julie, Val. No doubt, this wasn’t an easy story to write. I’m really looking forward to reading this book. Thank you, Jill! I also have ENTRUSTED, that first introduces Carla. That is a contemporary romance about surrendering fear, loss, and change. I appreciate you reading this! Hi Julie! It’s so fun to have you guest post with us :) I’ve enjoyed both your books and I’m sure our readers will as well. Thank you, Elizabeth. You have been a great encourager, and I appreciate that and you so much! An interesting take on that verse. I’d never thought of it that way before, but it does make you think about it. God bless! I was the same, I always took that as a literal connotation. It really impacted me when I thought of it otherwise. I appreciate you reading this, Diana! Thanks so much for being our guest today, Julie! I enjoyed reading your take on that verse, and it certainly makes sense. I have one of you books on my Kindle – Entrusted, I think. So many books, so little time! Thank you Valerie, for having me today, I really appreciate it. Yes, Entrusted was my first one, and Engaged is coming soon. I definitely understand, time is my issue today, and always! Thanks for introducing us to a new author and series. I find this blog has a good mix of dark and light but always beautiful stories to share and I appreciate the diversity. I agree! I love reading this blog, and I’m thankful Valerie offered the chance to share today. Blessings on your day, Priscila! I have heard many good comments about your books, Julie, and am anxious to read them! So glad you are visiting here today. Thank you, Jackie! I appreciate the encouragement and you leaving a comment. 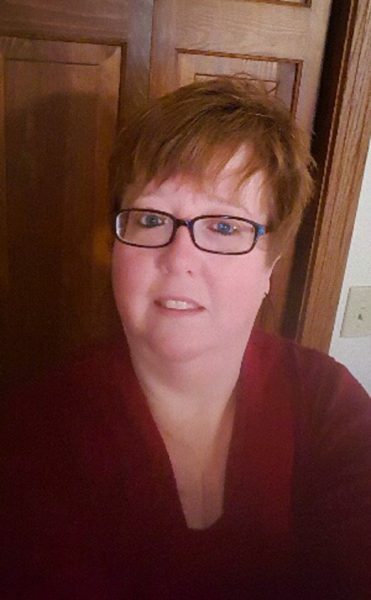 Thanks, Narelle, and for sharing on Twitter. :) I appreciate you reading the post! The past is so tempting to try and forget, if there are things not so pleasant. My dad was an alcoholic and I dealt with that for 28 yrs until he had a massive stroke at age 46. I had to sit on his grave one afternoon and poor my heart out and forgive him. It was hard! Gail, the best definition I heard on forgiveness is “letting go of the fact the other person didn’t meet your expectations.” Alcoholism is something I know well and it definitely was something I had to surrender. I plan to write more on that in future books. Thank you for sharing your heart, and reading the post. Your post made me think of Ashley Baxter in Karen Kingbury’s Baxter Family series. Your book sounds really interesting. I’ll have to add it to my reading list, which never seems to shrink no matter how many books I read. I LOVE the Baxter series. I understand the growing book pile, I have one as well. I hope you check out my books, and enjoy them! Thanks for reading, Jessica!